That very serious problem is broader than the subject of the book, which is about the return of the old idea that Jesus of Nazareth did not exist. Like Marduk, Isis, Zeus, or Janus, the Christian God is supposed to be a mythical figure. Casey, who understands that the humanities only function well when their results reach the public, is alarmed since a part of the public has started to ignore recent research and now prefers ideas that have become obsolete long, long ago. So he refutes the arguments of the ‘mythicists’. For example, when they argue that Paul’s letters say so little about the man Jesus because he did not exist, Casey reminds the reader that in Antiquity most information was passed on orally. Elsewhere, he explains that if the story of Jesus is similar to a pagan myth, this does not necessarily mean that it was borrowed. And so on. As argued elsewhere, Casey makes it sufficiently clear that mythicism is an unnecessary hypothesis. A recurring theme is that the skeptics do not understand how historians work. The mythicist sees contradictory sources as evidence that the claims are false, while the ancient historian uses them to separate the plausible from the less plausible. The mythicist builds his reconstructions on what he finds in the sources, while the ancient historian considers the sources as incomplete and investigates what they represent. The mythicist wants something to be either true or false, while the ancient historian sees probabilities. The mythicist, Casey summarizes, thinks like a fundamentalist: the written sources contain all information you need and have to be consistent. Sadly, Casey often overshoots his targets. An example is the skeptical claim that the Gospels were composed late in Antiquity because the oldest manuscripts are late. Casey is right to say that this is nonsense: there are several quite ancient papyri. Besides, the world of the Gospels is that of the Dead Sea Scrolls, of rabbinic literature, of Philo, and of Josephus. The communis opinio is therefore that the Gospel of Mark dates back to around the year 70, and that the Gospels of Matthew, Luke and John were written in the last quarter of the first century. At this point, Casey ought to have rested his case. However, he chooses to defend a more extreme position: Marcus wrote in c.40, just ten years after the crucifixion. This theory, developed by Casey’s student James Crossley, is unusual and mythicists can quite easily discover that many scholars are not convinced. By defending a particular interpretation, Casey makes it easy for his opponents to ignore him. The two last points are in fact sides of the same coin. While hundreds of thousands of old books have become available online, libraries have closed their reading rooms, while scholarly literature vanished to pay sites. If outdated information becomes easier to access and reliable information is locked away, the return of refuted information is inevitable. The mythical Jesus is not the only example of bad information driving out good. Nationalists and fundamentalists have in recent years caused extraordinary damage to the public knowledge of the ancient world. It is good, very good, that Casey writes back, but the serious problem I mentioned at the beginning of this piece, is far more serious than the two or three causes he recognizes. Nowadays, a quarter to a third of the population in the western world has benefited of higher education and this group thinks, for reasons beyond the scope of this review, far more critical about scholarship than earlier generations. Scholars can no longer be content with presenting mere facts, because there is so much information on offer that skeptics (like everyone else) must select what they feel they can use. Since the nineties, the universities have to compete with other sources of information. The answer is well-known. Those explaining science and scholarship most offer not just the facts, but must also explain the scientific/scholarly process. Casey does precisely this and I am glad he did. Still, it is not enough, because there will remain people who do not want to believe. The final step is to discover and address the anxieties that prevent general acceptance of the results of scientific and scholarly research. Unfortunately, academics tend to regard emotional arguments (such as revulsion of religious fundamentalism) as irrelevant to scholarly debate. That is an understandable reflex, but for sceptics, those emotional concerns are quite real. If Casey had wanted to convince the mythicists, he ought to have taken this into account. Because Casey ignores the heart of the matter, he will convince no mythicist that the scholarly method really is the most reasonable. As the book is also marred by several sneers at papal corruption and ad hominem arguments (apparently, it matters whether a scholar is gay or a socialist), there is enough for skeptics to see Jesus. Evidence and Argument or Mythicist Myths? as evidence that the humanities have really lost their way. And indeed: internet forums show that they have already drawn that conclusion. Casey has just achieved the opposite of what he intended to and his book can only be seen as unsuccessful. Still, it is important. The author is one of the first scholars who seems to sense that if the quality of information about scholarship does not raise with the public’s level of education, the public can and will turn away from scholarship. Casey has done his best, but to restore support for the humanities, a far more professional approach is needed. This entry was posted on Monday, July 28th, 2014 at 1:06 pm and is filed under ancient history, judaea. You can follow any responses to this entry through the RSS 2.0 feed. You can leave a response, or trackback from your own site. Since when did Richard Carrier think like a fundamentalist? Didn’t he write a book on the application of probability theory to history? So the reason there are no “good” defences of the historical Jesus is because the “good” arguments are being held behind pay walls? That doesn’t appear to be a problem for other disciplines, well able to popularise their latest findings. Could it be that the with the higher level of education, fig leaf arguments like “oral tradition” just don’t impress any more, or – perish the thought – that there is simply less deference before the communis opinio of an academic elite? I would not call oral tradition a fig leaf argument; but it is poorly explained, so we mustn’t be too surprised when people do not accept it. I am currently looking for a book that explains Q to a larger audience. It seems not to exist. If professional academics do not explain their facts and methods, they must not complain that nobody seems to understand them. Actually, I don’t think John wrote until the second century, and I doubt Luke wrote until shortly before the end of the century. And, depending on provenance of where he wrote, time delay in receiving news about the Jewish Revolt, and exact motivation in writing, Mark may not have penned his work until, say, 71 CE or so. 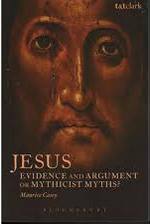 Dr. Lendering, I think you should write a book in response to Richard Carrier’s new book “On the HIstoricity of Jesus Christ”. Carrier is a proponent of mythicism and thinks it’s true despite evidence to the contrary. Have just read the book. I’m afraid the review is not totally fair with the late dr. Casey. He was a biblical scholar who refuted mythicism, not a social scientist to explain its resurgence. This job he did excellently, with much patience and erudition and, in spite of some minor flaws, very convincing.